Our first assumption, then, will be that these dated papyri have been discarded (one way or another) by their original owners. 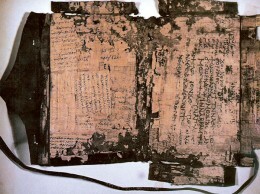 Given that they consist of deeds and contracts, with the latest (dated to the year 348) being a deed of surety, we will further assume that a minimum of two full years has passed between the original creation of these dated papyri and the time that they were considered candidates for being discarded. The best source of data available regarding the amount of time that might have passed between the original use of a dated papyri and its reuse for another purpose comes from Turner’s 1954 article “Recto and Verso,” where Turner examines 40 extant papyri that can be dated both in terms of their first use (on the recto) and their second use (on the verso), with relatively precise dating (on both sides). The original idea for the use of Turner’s data in this regard comes from the footnote to Turner’s article in Nag Hammadi Codex VII, ed. Pearson and Wisse, p. 1. While this reference class may not be completely optimal as a gauge for the length of time between the first use of a papyri and its second use as codex binding, it is the closest proxy available. 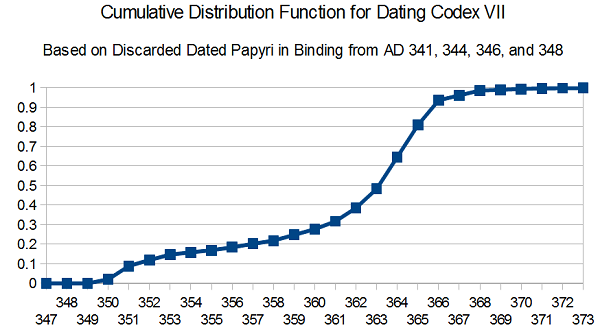 It does, in any case, give a good sense of when the original dated papyri were no longer needed for their original purpose and could be put to another use (or discarded), and the data set already accounts for a time lag that existed between when the papyri were not needed intact (with their writing only on the recto) and when they were used again (with writing on the verso). Therefore, building a model from this data is a reasonable choice. Of the 40 examples surveyed by Turner, a full 11 of them had a second use dated within 24 months of the first use (7 within one year and another 4 within two years). However, the nature of these examples is that the second use is coming from the same person or persons as the first use (as, for example, with a letter to and from a particular correspondent being written on both sides of a papyrus). These examples must be excluded from the data set, as we’ve assumed above that the reuse of the papyri in the binding of a codex is being performed by a third party and at a minimum length of two years later. This still leaves 29 examples (with a lapse of time from 3 years to approximately 200 years) that are surveyed by Turner that can be used to create an estimate of the length of time between the creation of the dated papyri and their secondary use as binding for a codex. This gives us these results. The data can be viewed in an Excel spreadsheet on Google Drive. 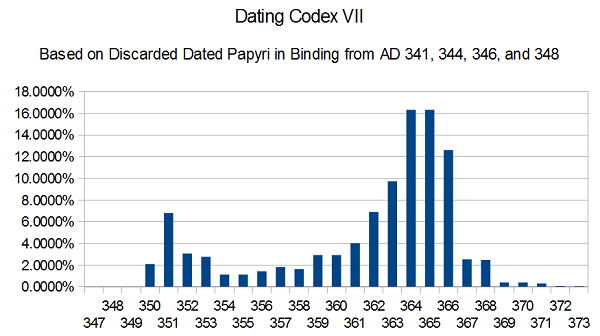 Based on these results, I believe that we can be more specific about the dating of the binding of Codex VII. To refer to the terminus a quo as being 348 or 350 is correct, of course. The terminus ad quem, however, seems to be around 370. Overall it seems best to refer to the date of the binding of Codex VII as belonging to the “third quarter of the fourth century” (alternatively, ca. 360 CE +/- 10 years), as indeed the literature already often does (Nag Hammadi Codex VII, ed. Pearson and Wisse, p. 1). Whether we assign the very same date to the production of the codex itself depends on whether we assume that this codex was rebound; however, Ockham’s razor suggests that we should further take this as the dating of the codex itself. Either way, it sets a terminus a quo (earliest possible date) for the burial of the collection in an urn near Nag Hammadi, and it provides precious information regarding the dating of the Nag Hammadi codices generally, even though we don’t know exactly how far apart in time they were all produced.